For a healthy heart, brain function and healthy bones and teeth. NutraSea+D is a pharmaceutical quality omega-3 supplement with added vitamin D3. 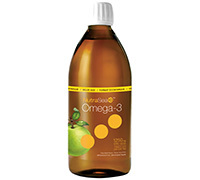 With a balanced ratio of EPA and DHA combined with 1000 IU of natural vitamin D3 it's an ideal supplement for optimal health and well-being in a delicious apple flavour. Ascenta's unique green tea antioxidant makes NutraSea+D the most stable and freshest tasting product on the market. The term “Pharmaceutical grade” is typically used in reference to fish oils. “Pharmaceutical grade” is not a regulated classification therefore misuse of the term is quite common. Typically the term refers to fish oil supplements that comply with the quality and purity standards set forth by the Council for Responsible Nutrition (CRN). The CRN Fish Oil Monograph is an internationally accepted standard that defines strict limits for product quality and purity. Products that meet or exceed these standards are qualified to use the term Pharmaceutical grade. NutraSea far exceeds the requirements of the CRN Monograph and therefore exceeds “pharmaceutical grade". Yes, molecular distillation is an important step in the processing of high quality fish oils. The primary purpose of distillation is to purify and concentrate the oil. Although heat is applied to the oil during the distillation step, the oil is not degraded because the process occurs under high vacuum and in the absence of light. This means air (oxygen) and light are removed to prevent the oil from oxidizing (degrading). Yes, every batch of NutraSea is tested for quality, purity and label claims by an independent laboratory. Pure Check is a quality assurance program through which Ascenta third-party tests every batch of product for quality, purity and label claims. The Pure Check quality tests results are posted on our website for consumers to see. Ascenta is the only developer of natural health supplements to provide consumers with this level of transparency assuring them that their product is of the highest quality. How does IFOS testing differ from the Pure Check testing? IFOS and Pure Check are very similar. Both are third-party testing programs to evaluate fish oil quality, purity and label claims. The reference standard for both programs is the CRN Fish Oil Monograph, which is considered the benchmark for pharmaceutical quality oils. The only major difference between IFOS and Pure Check is that IFOS is voluntary and the manufacturer does not have to test every batch nor are they required to post any batches that test poorly. Through Pure Check, Ascenta tests every batch of product and posts all results on its website. What types of fish are used for NutraSea? The fish used in the making of NutraSea are Sardina plichardus (pacific sardine) and Engranlis ringens (Pacific anchovy), which are caught in the clean, cold waters off the coast of Peru. These fish species are both members of the herring family. Because Ascenta is highly committed to sustainability, we only utilize fish that are sustainably harvested. For this reason we do not use Atlantic Cod (including Norwegian Cod), Tuna, Shark, or Swordfish. The Pacific sardine and anchovy used in NutraSea come from a highly regulated fishery which is currently undergoing sustainability certification by the Marine Stewardship Council. What ingredients other than fish oil are in NutraSea and why? The ingredients in our products do not contain any of the common allergens. The vitamin E is derived from soybean oil (non GMO) however it is purified to a level that allows individuals with soy allergies to safely consume it. Laboratory test results confirm that the green tea extract used in our products does not contain any detectable amounts of caffeine. Why is green tea a better antioxidant? Research trials found Ascenta’s green tea anti-oxidant to be 40% more effective than the leading fish oil antioxidant and 100% more effective than the synthetic antioxidant BHT. The patented green tea antioxidant used in Ascenta products is unique because it is soluble in oil unlike typical green tea extracts. This unique property allows Ascenta to incorporate the green tea’s exceptional oil stabilizing properties into our delicious tasting liquid fish oils. The amount of green tea in our formulations is present in very small amounts and neither affects taste nor does it contain caffeine. The green tea extract in our products is used as an oil stabiliser and not as a source of green tea catechins. You should therefore continue to drink your healthy cup of green tea! Does NutraSea contain any vitamin A or D? No. The fish oil in our products is extracted from the body of the fish, not the liver, so it does not contain either of these vitamins. Any trace amounts of vitamin A & D are removed during the purification of the oil. Ascenta has performed analysis to confirm that the oils do not contain detectable amounts of these nutrients. NutraSea+D has 1000 IU per serving of natural vitamin D3 added to the oil. Adding a natural source vitamin D to this product allows us to carefully control the amount and guarantees the potency in each batch. Vitamin D3 is an important pro-hormone responsible for many regulatory functions in the body including bone mineralization, immune system function and gene expression. Is the vitamin E used in NutraSea derived from soy? Yes. The vitamin E used in NutraSea is derived from certified non-GMO soy and because of the level of purification it poses no risk of allergic reaction and does not require an allergen statement. Is the oil in NutraSea cold-pressed? No. Plant based oils such as olive oil often use the term “cold pressed” however this is misleading. Cold pressed olive oils typically require a process temperature in the range of 30-50Â°C (86-122Â°F). In the case of fish oil pressing, the optimal temperatures range between 60-80Â°C (140-176Â°F). Using too low temperatures requires longer processing time and results in increased oxidation due to air exposure. During the subsequent distillation (purification) stage of the process, higher heat (200Â°C) is required. Although this step uses high heat, it is performed in the absence of air (vacuum) and light which prevents degradation of the oil. Regular quality checks throughout the process assures the oil is not been damaged. Can I cook with NutraSea? No. You can add NutraSea to foods after they’ve been cooked, however cooking with the oil will result in degradation in quality. NutraSea is great in salad dressings, pastas, yogurt, or mixed in a fruit smoothie. What is the difference between EPA and DHA? EPA and DHA are the active forms of omega-3. Their structures are very similar and differ by only two carbons and one double bond. EPA and DHA work together in the body but have different biological roles. EPA EPA is the precursor to a class of anti-inflammatory hormone-like molecules called eicosanoids. Eicosanoids play a vital role in regulating inflammation, blood pressure, blood clotting, immune function and cell growth. They are beneficial for heart health, mood balance, enhance joint health and improve other inflammatory conditions. DHA Research indicates that DHA is extremely important to components of cellular membranes and is highly concentrated in all nervous system tissue including the brain and eyes. Dietary DHA improves cognitive and visual development and is protective against macular degeneration, stroke, dementia and Alzheimer’s disease. DHA is especially important during pregnancy and nursing. Why can NutraSea become cloudy in the refrigerator? Is it harmful? The development of cloudy sediment near the bottom of the bottle after refrigeration is completely normal and does not affect quality. All natural oils have a temperature at which the liquid will change to a semi-solid state. You will have already witnessed this if you’ve ever put olive oil in the fridge. Returning the olive oil to room temperature causes it to go back to a completely liquid state. The temperature of your fridge is near the temperature where natural fish oil begins to turn cloudy and thicken. The fish oil will still be pourable and taste the same under these conditions. A slight increase in your fridge temperature or storing the fish oil on the fridge door shelf may prevent this from happening. Is NutraSea beneficial and safe to consume while pregnant and nursing? Yes. At the recommended dose, NutraSea and NutraSea+D are safe to consume during pregnancy and while nursing. NutraSea hp (high potency) formula is a more concentrated omega-3 supplement and therefore you should consult with a medical doctor or naturopathic physician prior to use during pregnancy. NutraSea supplies the omega-3 fatty acids that are vital to the healthy development of the fetal brain and nervous system. It also benefits the mother, as low omega-3 levels in pregnant or nursing women have been linked to an increase in post partum depression. Unlike regular consumption of fish and seafood, a purified fish oil supplement such as NutraSea is a safe and healthy way to ensure optimal omega-3 intake during pregnancy and nursing. How will the cholesterol in NutraSea affect my blood cholesterol levels? Although NutraSea contains a very small amount of cholesterol it will not elevate the levels of cholesterol in the body. Research has demonstrated that omega-3 fatty acids from fish have a beneficial effect on total cholesterol, especially the levels on the “good” cholestorl HDL. How does flax oil compare to NutraSea? Omega-3 fatty acids derived from plants are primarily in the form of alpha-linolenic acid (ALA), an inactive form of omega-3 that requires extensive metabolism in the body into the active forms EPA and DHA. A comprehensive review of the research on ALA metabolism by humans concluded that ALA results in insignificant amounts when converted to EPA and DHA (3.8% and 1% respectively). Because fish oil provides the active forms of omega-3, EPA and DHA, its health benefits are greater and supported by a large body of research. NutraSea is a fat - will I gain weight from taking it? No, the consumption of omega-3 fish oils actually promotes weight loss by stimulating the metabolism of stored fat. Research has demonstrated the ability of EPA and DHA to increase burning of fat through its effect on various enzymes and hormones such as insulin. No, Ascenta fish oil is highly purified resulting in complete removal of proteins. Does NutraSea come from wild or farmed fish? Our fish oil comes from wild, cold water Pacific sardine and anchovy, members of the herring family. These are small fish that feed primarily off plankton and algae. Because they are very low on the food chain, these fish contain very low levels of contaminants compared to other fish. What are the other omega-3 fatty acids? If the body needs omega-3, omega-6 and omega-9, shouldn't I take a supplement that contains all three? No. The typical diet contains a disproportionate amount of omega-6 and although some omega-6 is good, excessive amounts can promote a broad range of degenerative disease including heart conditions, arthritis and immune system dysfunction. Common sources of omega-6 in the diet include cooking oils, baked goods, cereals and red meat. Aside from omega-3 and omega-6, your body can produce all other types of omega fats including omega-9 and omega-7. These fatty acids are also plentiful in a typical diet. Directions: Adults and children 14 years and older take 1 tsp daily. Children under 14 years take 1/2 tsp daily.